Let's focus on what matters to Your Collectors. Let's find homes for Your Art! Discover how face-to-face sales of your art is as easy as sharing a rainbow. Learn to quickly tap into your natural "sharing gene". …movie, or book, you are already using some of the principals in the E’s of Selling Art System. The basic principles are virtual "Aha" moments that you will incorporate instantly. Stop hitting brick walls. Learn what to do when they say, "I need to think about it". There are some simple steps to incorporate that will quickly move you from “it was so close” to almost closing sales by accident. And…there’s very little “selling” involved! Go ahead and buy it now! Let's Find More Homes for YOUR Art! But wait! Is the clock running? Do you have a discount code? If you are on my list, check your email and grab the code! Cash in on this limited time offer and get your BIG savings! These WORK! 24 totally inspiring reminders of why you and your Art are important. Remain focused and stay in the zone in between clients! Take the guide to your art shows in a total stealth mode. There is an extra blank cover to hide the title cover because reviewing the “Departure List” before your next engagement is a must! Dive deep. Find YOUR voice. Find your authentic engagement levels. Learn how to be comfortable and comforting quickly in all circumstances. Need more Information? Keep reading! I’ve been immersed in the guide you sent and have been busy filling in the worksheets. It’s just what I needed to give me more confidence and purpose with my face to face interactions with studio visitors which happen on a daily basis. What I really like about your approach is that it’s very affirming of a thoughtful, empathetic way of interacting which is generally a good life skill! Every page of Mckenna’s guidebook is full of gems. They speak directly to me as an artist and it has helped me become more comfortable with the selling process. The flashcards are a great way to start my day at an event, reminding me of my purpose and attitude. Her “system” has made for a much greater emotional connection to my collectors. Thank-you, Mckenna. The E’s of Selling Art System is uniquely designed for Artists only and is a small investment that will pay you back many times over. I’m personally familiar with this In-Person Art Sales System developed by artist Mckenna Hallett, and can honestly say I believe it will bring you instant success at your very next event. I want to find more homes for my art NOW! How much time do I need to see results? I have a show very soon! If you were to just read through the guidebook, it would take a couple of hours. By the end of the guidebook, you will feel your confidence has grown in leaps and bounds! Some artists start by reading through the flashcards and find themselves so inspired, they see sales increase right away. But the WORKSHEETS – you must do the worksheets – should take a lifetime to complete! Overall, this is a “work in progress” learning system. If you are very new to selling, it may take time to incorporate all the elements. Just learning how to rid yourself of the “Four Dirty Little Words” could take some practice! Remember, it took time to hone the skills for your art to be what it is today and more learning is ahead! Honing your skills for better and more authentic engagement with your collectors takes time, too. Why is this effective for Artists? If you “hate” the selling part, you will love this system. It helps you experience engagements in a more authentic way. It helps find yourself and your words and your value. I rarely use traditional selling “techniques”. It barely uses “techniques! I don’t like the idea of “closing a deal” any more than you do. PLUS: It’s written specifically for Artists who are in actual Art presentation situations. That includes a phone conversation, too. It’s very detailed and comes from my nearly 45 years of selling fine art and rarities in San Francisco and Maui. And 25 years selling my own work to the public at fine art shows. How many flashcards are in the set? There are 24 flashcards on a thick stock to last for many years. Perfect companion at your art shows and other events. Most Artists like to read them at the start of the selling day or throughout an art show between visitors. But some artists tell me they like to read them everyday of the week. What kinds of statements are in the Flashcards? Mostly they are a reminder of some of the key principles from the E’s of Selling Art System, but they also are full of inspirational thoughts to keep you motivated at art events. Since they are the same size as a business card, they are very discreet and can even be kept in your pocket and ready to access at any moment! So far I have shipped to Canada many times. Also to England many times. I have shipped to France a few times and also to South Africa, Australia, and New Zealand. The shipments (except to South Africa) have mostly arrived within 10 days. If you want to me to ship to you to an outside address, just contact me directly via email. Include your mailing address and will give you an exact quote for postage (which I share with you 50/50) and send you a PayPal invoice. The shipments so far have ranged from $24 to $36 so you might pay as little as $12 US! Do you offer classes or additional instruction? I have been teaching the E’s of Selling Art for almost 30 years and love to get in front of live audiences! But I also am willing to do individual selling strategy consultations via Skype. Email me if you want more information. If you are part of an art organization, I can be hired to bring a variety of Artist Only topics and workshops to your group including the E’s of Selling Art and the ever popular, Smart Art Marketing for Online and Offline Sales. I am also building online courses. Many will be added in 2017. Join this list to stay informed. The testimonials make this sound great. Do you offer a refund if I don't get results? There is a 60-day money back guarantee. However, I require you show me that you have really done the work. If you do the worksheets and truly embrace the principles of the “Five E’s”, adhere to the “No Visible Business Cards” rule AND have learned to reduce your dependence on the “Four Dirty Little Words”, then it would be very unlikely (impossible?) that you wouldn’t get great benefits. However, if you are really feeling underwhelmed, I will give you a full refund or you can choose to schedule a free one-hour consultation ($89 value!) and I will try to help you in a one-to-one meeting. I want you to find homes for your art! Okay... what the heck are the Four Dirty Little Words? It’s tempting to tell you to buy the guidebook, but I love to share this hint. As much as possible, avoid using: I, Me, My, and Mine when you are presenting your work or sharing any information with potential collectors. Learn to use YOU and YOURS as much as possible. We are all naturally more interested in ourselves and “What’s in it for me”. If people hear I, Me, My, Mine over and over again, they lose interest in YOU because they don’t think you care about THEM. natural and authentic way of conversing, can increase sales instantly. Are you ready to find more homes for your art? There is a sixty-day money back guarantee. International Shipping is Available. Click to Email Me directly for international shipping quotes. Yes. I want to make a difference for more people. There are hundreds of affirmations throughout the guidebook. Here are six to get you started. Your creative spirit deserves these words. Buy Now. There is nothing here that will change who your are. In fact, this system will put you into a deeper understanding of who you are as an artist. There is nothing to lose. This system comes with a 60-day money-back guarantee. Find homes for your ART! This will not only let you become your natural, authentic, and loving self, it will bring you closer to your true calling: being an artist who makes a living from finding good and loving homes for your creations. Mckenna has deep wisdom to share. This is not just another book of sales techniques, the Es of Selling System creates a 180 degree shift in the relationship between you, your art, and your collectors. If you want to make a living as an artist, you must have this book. My wife and I had struggled with trying to build our pen making business. 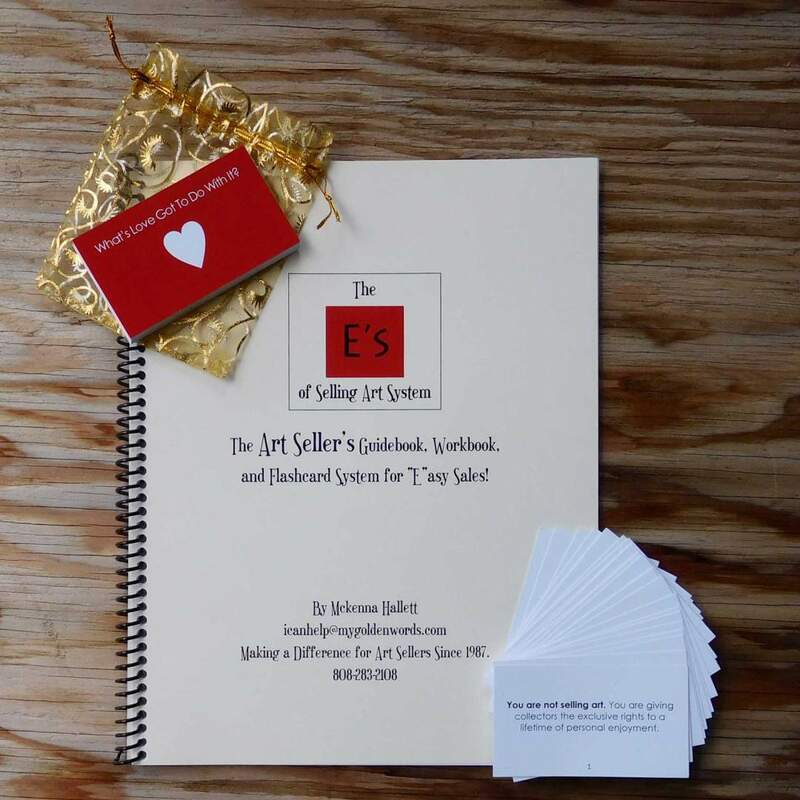 Fortunately, I heard an interview online with Mckenna Hallett talking about her book, “The E’s of Selling Art System.” I immediately ordered the book and read it within a weekend. It was phenomenal! It changed everything and helped us achieve a much better mindset for selling my art pens. I had only browsed my copy of the E’s of Selling Guide and intended on reading it the next day when out of the blue, I had a sale! Then I read the guide. I now realize it would have been a much larger sale had I known to avoid the “Four Dirty Little Words“. This guidebook is such a great tool. The Flashcards are really helpful. Having read the guidebook, I thoroughly recommend it. If you are doing in-person sales, this can ONLY help you. Mckenna has been selling art for many decades. The system she shares shows us a whole new attitude. This is truly a “system” and as Mckenna puts it, it will help you “find more homes for your art”. With a career that spans over 50 years – most of that career spent selling art – I know you can benefit from this system. It has been taught to thousands of artists since it’s inception in 1987. It’s not teaching you anything that you don’t already do whenever you are trying to “sell” someone on a good experience. There is nothing here that will make you become a pushy “salesperson”. There is nothing salesy in the system at all. It’s really all about love. Read some of my blog posts if you want to ease into the system.